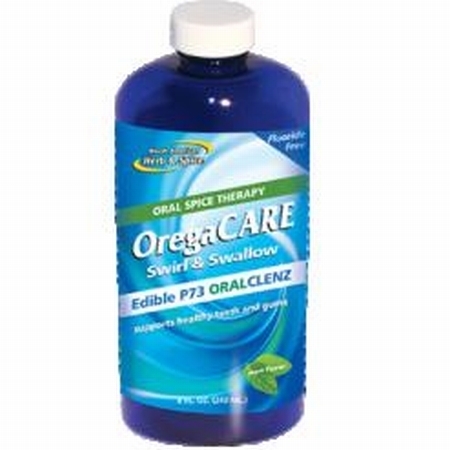 OregaCARE Swirl & Swallow is the only edible oral cleanser that provides the power of P73 oregano. OregaCARE Swirl & Swallow is the only edible oral cleanser that provides the power of P73 oregano. Now you can promote the health of teeth and gums without the use of harmful substances like fluoride and other chemicals. Plus, it helps the whole body. As a mouth cleanser and body tonic, it’s good for your health and saves you money. OregaCARE Swirl & Swallow is one component of a family of products that supports the teeth, gums and breath with oral spice therapy. OregaCARE Swirl & Swallow is ideal for use with OregaFRESH P73 toothpaste and OregaSMILE oral health system. What is in OregaCARE Oral Cleanser? Wild oregano P73 juice: The most well known benefit of oregano is its microbial killing powers. Oil of oregano is the premier natural antiseptic. Every microbe tested against it has been succumbs to it and there's no tendency for buildup of microbial resistance. Wild mint essence: Refreshing scent. Essence of wild sage: It is a powerful antioxidant. Essence of bay leaf : It has antimicrobial activity against some of the most common pathogens . Organic stevia: Added natural flavor. Rinse or gargle for at least 30 seconds then swallow. Shake well before using. Safe for children.